We offer an online driver's education course for teens under 18 years old. The curriculum is recognized by the Department of Motor Vehicles. 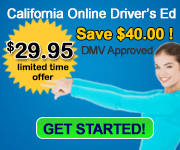 Graduates of this home study program will receive a California DMV Driver Education Completion Certificate. Allow 7-10 days for certificate to be mailed to you. Course must be completed within 45 days from purchase. Tablet friendly and the final exam can be used to practice for your permit test.